In the middle of the Indian Ocean, somewhere between South Africa and India, the time came to post a description of the midterm for my Introduction to the Visual Arts course that I was teaching with Semester at Sea in Fall 2017. As I have been doing on my home campus for the past 5 years or so, I had my students collectively decide on the structure of the exam. Catching my balance as the ship rocked, I offered the class some options and briefly explained the pedagogical benefits of each: they could write an essay exam tied to course themes, do a take-home paper incorporating each unit covered so far, or propose a creative means for repackaging the course content. The buzz in the room was palpable. They were excited! Collectively we brainstormed what this creative alternative might look like: game shows, skits, posters, group presentations, etc. Weighing aloud with them the learning potential of each suggestion, we settled together on a “re-teach-a-thon” whereby they would work in small groups to “re-teach” each of the 8 units we had covered so far. Since Day 1 on the ship my students had been regularly working in 4-person “Home Groups” for daily discussion activities and semester-long project research, so they already had rapport within their small groups. 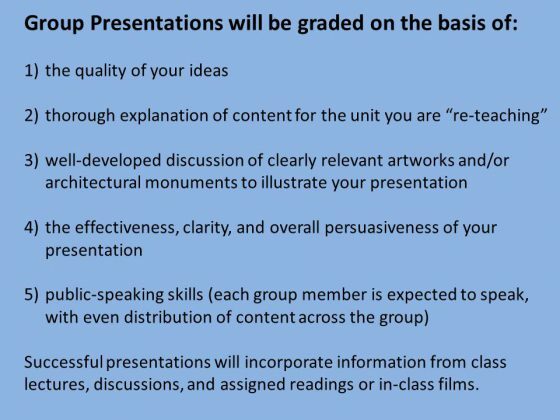 I determined the parameters for the 10-minute presentations, made clear my grading criteria, and set the students to work. The results of this midterm “Re-teach-a-thon” exceeded my expectations. These 100-level non-majors presented thorough and accurate content in visually clear PowerPoints, in some cases covering complicated and nuanced material involving gentrification, post-colonial theory, and identity politics in global art. Notably, in their final exam (which was a 10-topic, short-essay, cumulative in-class exam) many students did best on questions related to the 8 units from the “Re-teach-a-thon”. 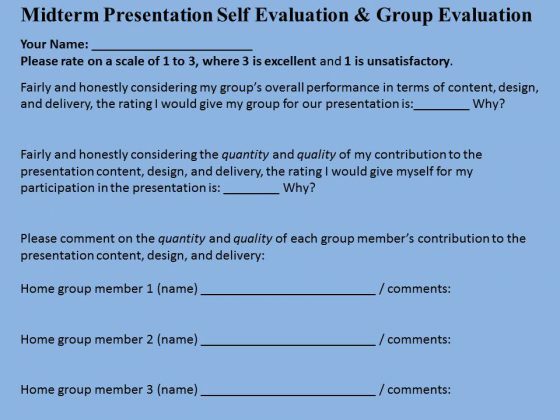 To assess the midterm presentations I had each student fill out a self- and peer-evaluation form that asked them to comment on the quality and quantity of their contribution and that of each group member. I also took copious notes on each student’s content and delivery as the groups presented. I forewarned the class that group members would receive the same grade, but in truth I adjusted upward or downward for individuals in groups where students’ contributions were uneven. This seemingly spontaneous solution to mid-semester testing derives from the confluence of three guiding principles that I use in developing exams for all my art history courses. First, in survey-level courses I tie the content of tests to the four course themes that all sections use to navigate content and focus questions on big picture concepts that will “stick” long after memorized facts evaporate. 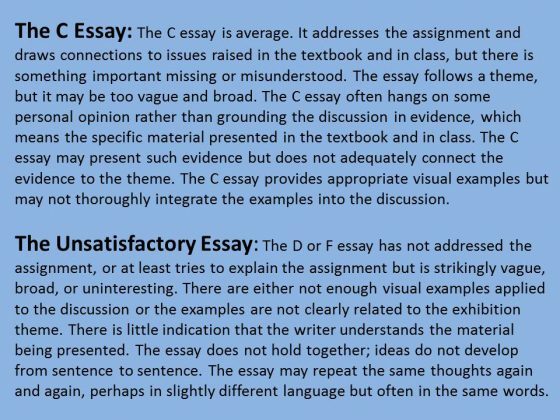 In the case of upper-division courses, I tie content to major themes and issues aligned with course objectives. Second, I narrate for students the pedagogical “Oz behind the curtain” in relation to in-class modes of engagement (such as structured discussions, activities, and collaborative content sourcing) and testing models to help them understand why tests are necessary and what benefit certain question types have for them as learners. Third, I give students agency in participating in the design of tests and emphasize that it is a privilege as well as a great responsibility for them to contribute to composing their exams. All three of these aspects encourage student buy-in around testing and I have observed a significant increase in student satisfaction without having to lower my standards or reduce the depth and breadth of course content. Another successful application of these principles came in Spring 2017 after my students in the 200-level Survey of Modern and Contemporary Art had spent the semester demonstrating their earnestness about participating in designing test formats. I offered the 40-person class the option to write an open-book take-home final exam for which they would construct an exhibition populated by works of art we had studied, related to each other by connection to a curatorial theme derived from a social or artistic issue they as individuals felt committed to. 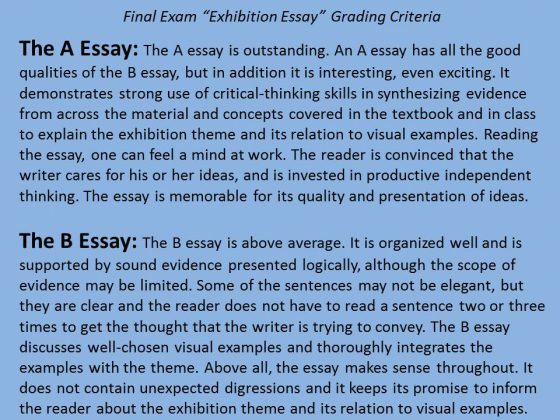 The result was a 5-6 page exhibition paper framed as an argument, guided by a rubric and my grading criteria. My grading criteria are adapted from the Derek Bok Center for Teaching and Learning at Harvard University. The majority of students hit the nail on the head. Most essays presented a solid connection between the students’ chosen issue and the artworks they included; some were even surprisingly inventive and clever! This final exam format fulfilled the three guiding principles noted above but more importantly it added some zest into the closing days of the semester. My hope is that these survey students will enter their upper-division courses primed to take their learning seriously while finding some joy in studying art history. I have even experimented with blocking the 15-week term differently by intensively covering content for my 300-level Women in Art History course in 10 weeks, followed by a cumulative essay exam in Week 11. This schema allowed us four weeks to focus exclusively on a collaborative research project that let students to put their learning into practice. The class of 30 students designed, researched, and implemented an online exhibition accompanied by 6-page research papers on individual works of art from our museum’s permanent collection. They may not have realized it, but the process of creating this exhibition was effectively a test of students’ collective knowledge and skill gained during the semester. From choosing an exhibition theme tied to course objectives, to strategically selecting artists and specific works to include, to designing a digital exhibition that interrogated connections between artworks and issues we had addressed through discussion of course readings, the students integrated their learning across the semester. From large surveys of 100 to 300 students, to medium-sized survey and upper-division courses of 30-50 students, to seminars of 10 or so students, variations incorporating these pedagogical principles can build energy around testing rather than evoking fear and loathing in the typical college student. In semesters where I involve students in designing the testing format, including question types, point values, and quantity of questions, I have found that they are generally better prepared for exams and less reactive when their grades come back. Having experimented with various test types and some creative alternatives, I am now a firm believer that framing the test experience is key to student success in any art history course. Planning collaboratively with my students in both survey and upper-division courses gives them more agency in the learning process. And frankly, it makes teaching fun!